My paintings are inspirations from nature, observed through the window of an artist’s eye. ​"Our job in this life is not to shape ourselves into some ideal we imagine we ought to be, but to find out who we already are and become it." Stephen Pressfield, The War of Art. Elaine Jary is primarily a contemporary realist watercolor painter. She focuses on the beauty of nature as well as portrait and figurative representation. Her goal is to contribute in a small way through her paintings to the beauty that is always present but may be overlooked in our busy lives. Ms. Jary was born in Fort Worth, Texas and has lived in the area her entire life. 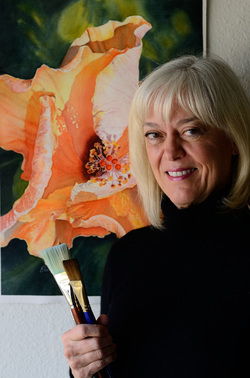 After obtaining a Bachelor of Arts in Graphic Communication from the University of Texas at Arlington, she put aside her creative activities for many years, until her passion to create art once again became a priority in her life. She considers herself a lifelong student and continues to attend workshops to expand her painting knowledge and experience. However, she feels the best education is acquired from making painting a regular, daily practice. Ms. Jary has studied with notable watercolor artists including Mary Whyte, Fealing Lin, Frank Eber, Michael Holter, and Janet Rogers. Her paintings are found in private residences in Texas, Washington, Wisconsin and Virginia. The idea for a painting begins with an interesting composition that conveys an emotion. The subject matter could be the morning light on a beautiful blossom, the pattern of fall leaves and their shadows in the corner of a patio, or the joyful smile on a child’s upturned face. The forgotten ability to be in the present moment; for example, a child intensely watching a ladybug crawl across a leaf, is portrayed in a painting. The viewer pauses to observe this captured moment in time. The intention is that the painting conveys a message of beauty that connects us and provides hope, enriching our lives.